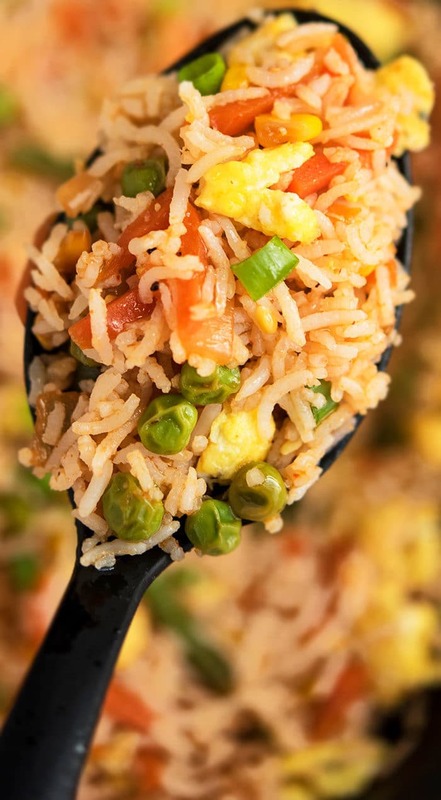 The best, healthy, quick and easy vegetable fried rice recipe, homemade with simple ingredients in one pot over stovetop. This 30 minute meal is better than Chinese takeout. Loaded with scrambled eggs and frozen vegetables. 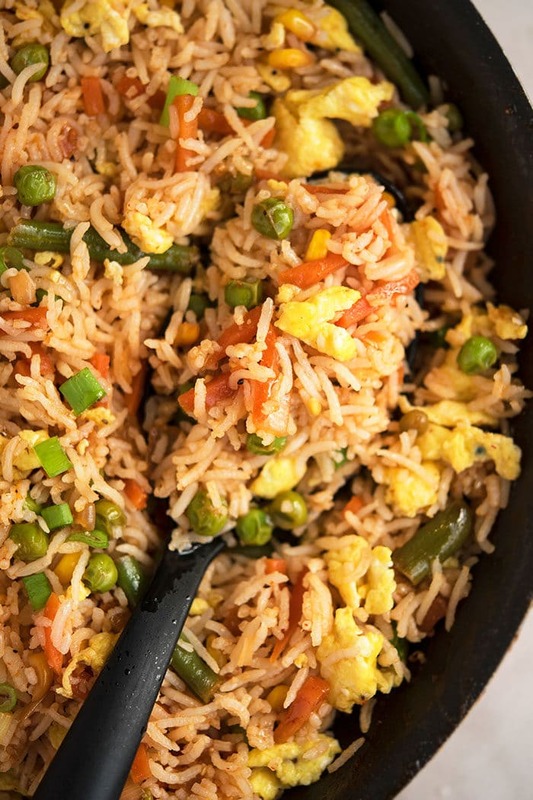 In my family, an Asian meal won’t be complete until I make vegetable stir fry rice or this Bacon Fried Rice (One Pot). 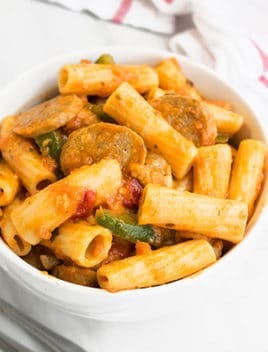 It’s a versatile dish that can be adjusted to your needs. 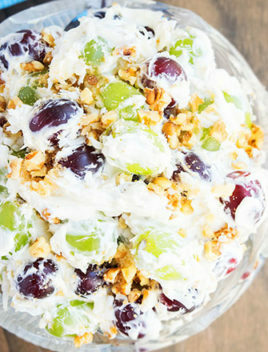 Both, kids and adults love it and it always gets great reviews at dinner parties! Furthermore, it’s an awesome way to use up leftover rice. 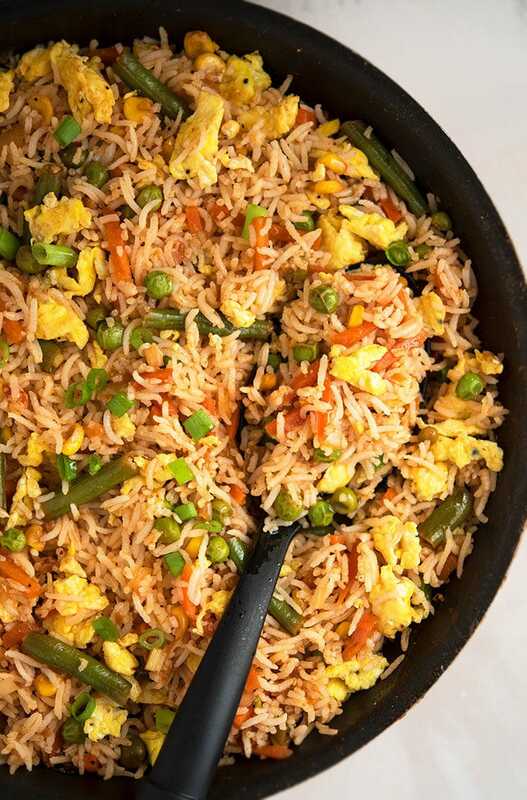 How to make vegetable fried rice? Mix it with the veggies. Mix in seasonings and Asian sauces. Garnish with green onions and you are done. What sides to serve with homemade Chinese vegetable fried rice? If you want to add a salad to this meal, try this Asian Cucumber Salad (One Bowl) because it works very well and compliments the whole meal. 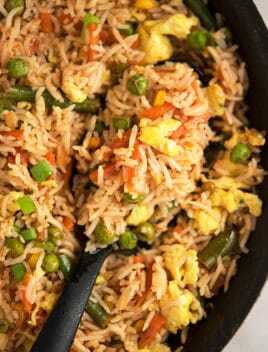 Indian vegetable fried rice– This has spicy kick to it and a strong garlic flavor. Add some red chili flakes, more Sriracha sauce/ red chili garlic sauce. Omit vegetables– If you are not fond of vegetables, replace them with 1 additional scrambled egg to make egg fried rice. Add chicken– Stir fry chicken with some salt and pepper and mix that into the rice at the end to make chicken fried rice. Add shrimp- Stir fry shrimp with some salt and pepper and mix that into the rice at the end to make shrimp fried rice. Make it Hawaiian- Add 1/2 cup of sliced pineapples and some red chili flakes to give it a wonderful sweet and spicy flavor. Add kimchi– Stir fry about 2 tablespoons of it, along with the vegetables. Add more or less, based on your preference. Some people also add a little kimchi juice to really enhance that tangy flavor. Add other herbs, spices, sauces– Replace Asian spices and sauces, with Mexican taco seasoning or Italian herbs or Mediterranean seasoning and spices to give it a flavor twist from a different cuisine. The process will still be the same. 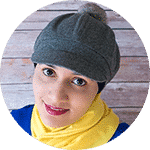 Adjust amount of seasonings– This is entirely a personal preference. Add more or less of whatever you like/dislike. 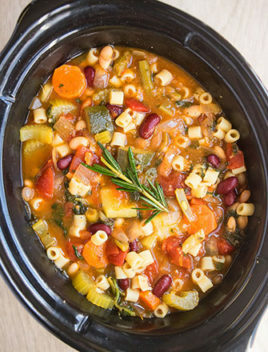 Use nonstick pot or pan- Because this prevents sticking and burning. 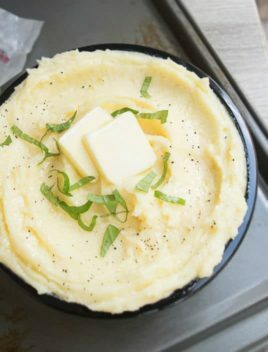 Also, use a large pan or wok so that there is enough space for all the ingredients to blend together more evenly and nothing clumps together. What rice to use for fried rice? It can be brown, jasmine or even basmati. Medium or long grain rice is best. Remember that you need to use boiled/cooked rice. It should be chilled and a little stale. That’s why leftovers and a day old rice work best because they hold their shape and stay separate and don’t clump together, when stir-fried. For a healthy twist, you can replace rice with cooked quinoa too. Can you freeze fried rice? No, because the texture changes when it thaws. I am not fond of it but some of my friends don’t mind it. Garnish options- Green onions are the best but you can also toss some roasted sesame seeds. It adds a wonderful aroma and nice crunch. You can also toss some roasted cashews or peanuts, which makes this dish unbelievably delicious. Don’t omit sesame oil- Even though you can replace it with vegetable oil or olive oil, that small quantity of sesame oil adds A LOT of flavor! Fresh or frozen vegetables can be used– I prefer frozen because it’s convenient, washed, sliced/chopped and cooks faster too. Use low sodium soy sauce– Because that prevents this meal from becoming too salty. I love making rice for dinner because a small quantity can serve a large crowd and it’s filling and economical. Also, you can pair it with so many curries and gravies from different cuisines that it never gets boring. Quick and easy vegetable fried rice recipe, homemade with simple ingredients in one pot over stovetop. This 30 minute meal is better than Chinese takeout. Loaded with scrambled eggs and frozen vegetables. Heat butter, vegetable oil, sesame oil in a large nonstick pot over medium high heat. Add onion, garlic, frozen vegetables and saute for a few minutes until they are tender. Push these vegetables to one side of the pot and add eggs. Scramble them until fully cooked. Mix them together with the veggies. Add boiled rice, soy sauce, Sriracha sauce, oyster sauce, salt, pepper and mix everything together. Garnish with lots of green onions. Enjoy!